Our school day is from 9:00 to 1:00 for all five day classes and 9:00 to 12:00 for the youngest two year olds. Children may arrive any time after 8:45 am. Pick-up time is between 12:45 a.m. and 1:00 p.m. The school serves a simple snack of water, fruit or vegetable and a plain cracker mid-morning. Sometimes children prepare a snack and sometimes parents bring snacks. All children in the 1:00 o’clock classes bring their lunch everyday. View more information about the early morning and afternoon care programs and enrichment classes here. Two-day (Tuesday & Thursday) Program. Children who are at least two-years old by September 1st qualify for the two-day (Tuesday & Thursday) classes. Twelve children form this group with a teacher and a full-time assistant. Music, art, language and listening, personal growth opportunities, fine and gross motor activities, social interaction, and concrete math, science and social studies activities are an integral part of the curriculum. Toilet training is not a requirement for attendance. Two-day children participate in the special music, art and science programs. They are invited and encouraged to come to all school events that occur on Monday, Wednesday or Friday mornings if they are accompanied by a parent or other adult. Parent-teacher communication is encouraged. Group conferences are scheduled in the fall and January, and a brief progress report is sent home in February and at the end of the year. The three-day (Monday, Wednesday, Friday) Program is for children who are three by February 28th, they qualify for the school’s three-day program which ends at 1:00. Twelve children form this class.The Five-Day Program is for the oldest Two-Year olds who turn three by December 31st:Toilet training is a requirement for this class.There is a teacher and a full-time assistant in each of the two-year old classes. Music, art, language and listening, personal growth opportunities, fine and gross motor activities, social interaction, and concrete math, science and social studies activities are an integral part of the curriculum. two-day children participate in the special science and music programs visit the outdoor play teacher, and participate in the special art program. Parent-teacher communication is encouraged. Group conferences are scheduled in the fall and January, and a brief progress report is sent home in February and at the end of the year. Children who are three by September 1st and are toilet trained are eligible for the five-day program. The children are grouped according to age into three classes of 14 to 15 children. Each class has a teacher and a full-time assistant. Early and/or afternoon care is available. Five-day three-year old classes participate in all special programs – art, music, science and outdoor play. In addition, the daily classroom program consists of music, art, language and listening, personal growth opportunities, fine and gross motor activities, social interaction, and concrete math, science and social studies activities. The “hands on” approach to learning is used and teachers employ a curriculum which provides activities and materials that are anti-biased, concrete, real and relevant to the lives of young children. Parent-teacher communication is encouraged. A group conference is held in the fall and individual conferences are held in January. A written progress report for each child is sent home at the end of the school year. Children who are four by September 1st are placed in one of three five-day classes. The oldest of these classes is comprised of children who turn five in the fall and some children who are already five but are taking an extra year before entering kindergarten. Each class is comprised of 16 children, a teacher and a full-time assistant. Early and/or afternoon care is available. 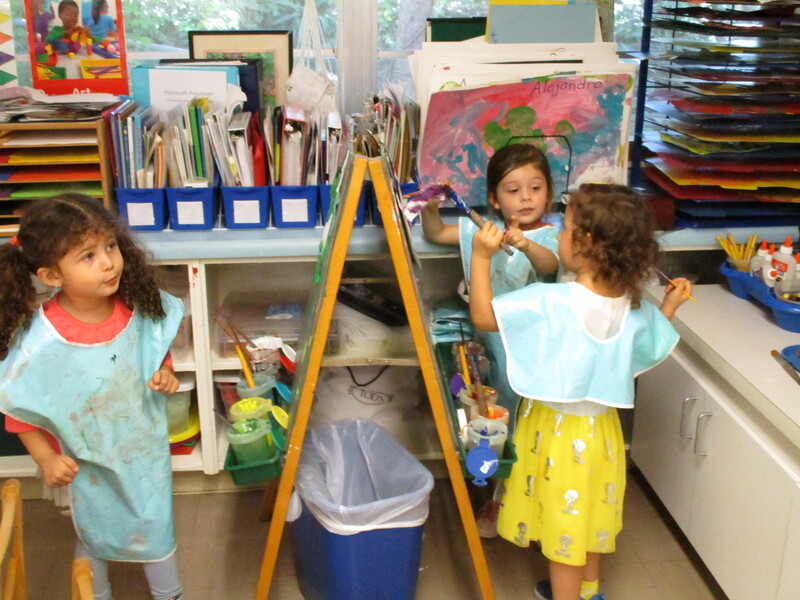 Five-day four-year old classes participate in all special programs – art, music, science and outdoor play. In addition, the daily classroom program consists of music, art, language and listening, personal growth opportunities, fine and gross motor activities, social interaction, and concrete math, science and social studies activities. The “hands on” approach to learning is used and teachers employ a curriculum which provides activities and materials that are anti-biased, concrete, real and relevant to the lives of young children. Parent-teacher communication is encouraged. A group conference is held in the fall and individual conferences are held in January. A written progress report for each child is sent home at the end of the school year. The summer program provides activities to promote the physical, emotional and social growth of preschoolers. We want to help the children have an enjoyable and stimulating summer. The personnel are selected from the Preschool’s regular, dedicated teaching staff. Additional teachers specializing in early childhood education supplement the staff when enrollment necessitates. The summer program is held in June, from 9:00 a.m. to 1:00. Afternoon and early care are also available on an hourly basis, until 3PM. Children attending range in age from those who will be three by December 31st to those who will start first grade in September. Two-day (Tuesday & Thursday) Program Children who are at least two-years old be September 1st qualify for the two-day (Tuesday & Thursday) classes. Ten to eleven children form these groups with a teacher and a full-time assistant. Music, art, language and listening, personal growth opportunities, fine and gross motor activities, social interaction, and concrete math, science and social studies activities are an integral part of the curriculum. Toilet training is not a requirement for attendance. Two-day children participate in the special music, art and science programs. They are invited and encouraged to come to all school events that occur on Monday, Wednesday or Friday mornings if they are accompanied by a parent or other adult. Parent-teacher communication is encouraged. Group conferences are scheduled in the fall and January, and a brief progress report is sent home at the end of the year. Three-day (Monday, Wednesday, Friday) Program Children who are 3 by December 31st qualify for the school's three-day program which ends at 1:00. This class is also an option for young three-year olds (summer birthdays) whose parents do not wish a five-day program. Thirteen children form this class. Toilet training is a requirement for this class and children may stay for early care and/or afternoon care. Children who are two and a half by September 1st and three by March 1st qualify for the other three-day class which ends at noon. Eleven or twelve children form this class. Toilet training is not a requirement. There is a teacher and a full-time assistant in each of the three-day classes. Music, art, language and listening, personal growth opportunities, fine and gross motor activities, social interaction, and concrete math, science and social studies activities are an integral part of the curriculum. Three-day children participate in the special science and music programs visit the outdoor play teacher, and participate in the special art program. Parent-teacher communication is encouraged. Group conferences are scheduled in the fall and January, and a brief progress report is sent home at the end of the year. Children who are three by September 1st and are toilet trained are eligible for the five-day program. The children are grouped according to age into three classes of 14 to 15 children. Each class has a teacher and a full-time assistant. Early and/or afternoon care is available. Five-day three-year old classes participate in all special programs - art, music, science and outdoor play. In addition, the daily classroom program consists of music, art, language and listening, personal growth opportunities, fine and gross motor activities, social interaction, and concrete math, science and social studies activities. The "hands on" approach to learning is used and teachers employ a curriculum which provides activities and materials that are anti-biased, concrete, real and relevant to the lives of young children. Parent-teacher communication is encouraged. A group conference is held in the fall and individual conferences are held in January. A written progress report for each child is sent home at the end of the school year. Children who are four by September 1st are placed in one of three five-day classes. The oldest of these classes is comprised of children who turn five in the fall and some children who are already five but are taking an extra year before entering kindergarten. Each class is comprised of 16 children, a teacher and a full-time assistant. Early and/or afternoon care is available. 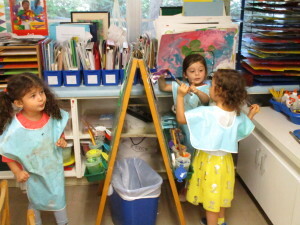 Five-day four-year old classes participate in all special programs - art, music, science and outdoor play. In addition, the daily classroom program consists of music, art, language and listening, personal growth opportunities, fine and gross motor activities, social interaction, and concrete math, science and social studies activities. The "hands on" approach to learning is used and teachers employ a curriculum which provides activities and materials that are anti-biased, concrete, real and relevant to the lives of young children. Parent-teacher communication is encouraged. A group conference is held in the fall and individual conferences are held in January. A written progress report for each child is sent home at the end of the school year. The summer program provides activities to promote the physical, emotional and social growth of preschoolers. We want to help the children have an enjoyable and stimulating summer. The personnel are selected from the Preschool's regular, dedicated teaching staff. Additional teachers specializing in early childhood education supplement the staff when enrollment necessitates. The summer program is held in June, from 9:00 a.m. to 1:00. Afternoon and early care are also available on an hourly basis, until 3PM. Children attending range in age from those who will be three by December 31st to those who will start first grade in September.